FULLY ONLINE courses: All instruction takes place completely online using a learning management system (LMS). May require a campus visit for orientation or proctored exam(s). Online course fee is required. HYBRID course: Hybrid courses require both online and regularly scheduled face-to-face participation. Hybrid course fee is required. You've registered, the quarter has begun, now get started! Contact your teacher by email and ask any questions you may have about your online course. 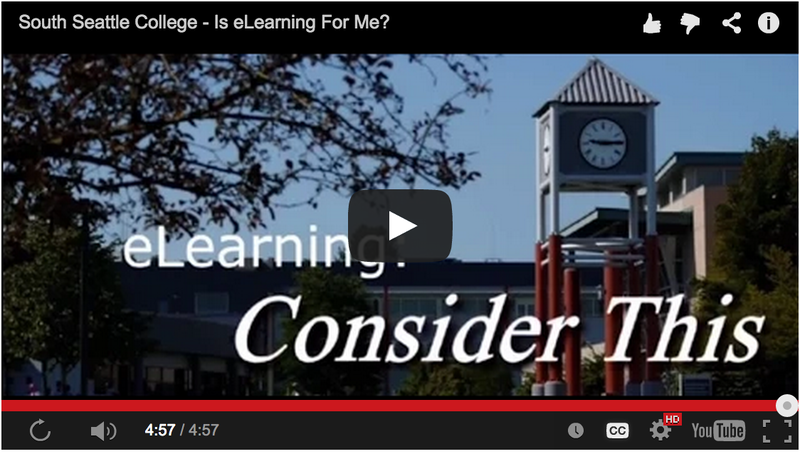 For any other questions about eLearning, please Contact us. If you are taking a face-to-face course with an online component ("web-enhanced"), ask your instructor for login directions, but contact eLearning staff if you experience any login problems. Log in to your online course after the quarter starts. HELP! I can't log in to Canvas! or... I can log in but I don't see my classes! -Make sure you aren't using a login from another campus or previous quarter. -NOT ALL COURSES are taught using Canvas. Check with your teacher. -Contact us if you continue to have login issues after the first day of the quarter. REMEMBER: Successful eLearning students have the necessary time and skills (including patience and flexibility) to learn online and complete their online assignments. Before you take any online class, you should be confident about your computer equipment, computer skills, and study skills, as well as understanding that technical problems sometimes require backup computer plans. You will be responsible for learning the technology needed to complete your class. Take a deep breath - you're going to be fine and we are here to help! Don’t miss out on important information and announcements. Keep your contact information current.